Welcome to TracfoneReviewer where we share the latest news, reviews and promo codes! Another generation from the LG Rebel lineup has been released from Tracfone - and just six months since the previous version. The LG Rebel 4 features a 5" touchscreen, quad-core processor, and Android 8.1 Oreo. It brings some modest upgrades to the previous version, the Rebel 3. At this time the Rebel 4 CDMA version is available but we do expect a GSM version (L211BL) in the near future. The Rebel line of phones has been a popular budget smartphone from Tracfone with a smaller screen size compared to most of Tracfone's offerings. 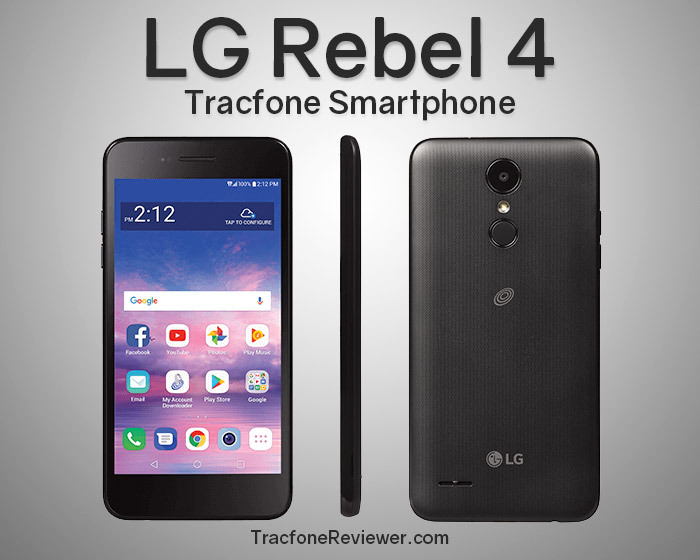 We were a little surprised to see the Rebel 4 released in the same year that the Rebel 3 became available to Tracfone users but it appears that Tracfone is speeding up the release of new phones for the fall season. There is not a lot that is different between the Rebel 3 and Rebel 4, but we will cover that in detail further on. For now, let's look at the pro's and con's for the Rebel 4. One of the issues that may arise for some users is the low storage and RAM on the Rebel 4. We hope Tracfone will release more devices with increased storage and additional RAM at a reasonable price but that is not the case with the Rebel 4. It is very good to see the Rebel 4 features the latest Android OS (at this time) with 8.1 Oreo. That's a nice improvement over the previous model, and only the third phone from Tracfone with this Android version. Now for the full list of features and specs. Below are the features, followed by the technical specs. While the Rebel 3 and 4 share a number of similarities, the Rebel 4 does have several upgrades that does make it a faster and more desirable phone. We will cover more about these differences further below. LG is a global electronics company operating in many different segments of the market including the mobile phone market. They are based in South Korea and are well known for offering a variety of different smartphones from high-end to budget that generally have good features and quality. 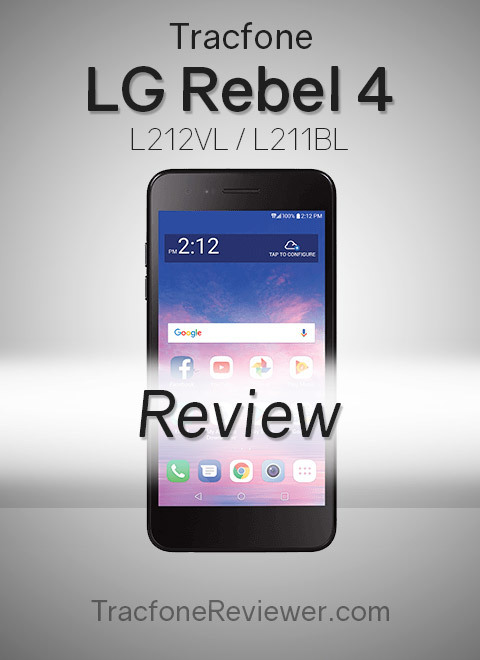 The LG Rebel 4 is by far one of their most budget friendly options, with many more options available with more performance at a higher cost. The LG V30, for example, has 64 GB internal memory, a larger screen and dual rear cameras, but retails for $499. The screen on the LG Rebel 4 is a 5" TFT (IPS) panel with HD resolution (1280x720). Clarity and color are both good for a phone in this price range and the DPI is just under 300 which is also good. There are not very many new smartphones with a screen this small, as most devices now feature 5.5-6" touchscreen displays. However, not everyone wants such a large device so the Rebel 4 fits the size requirements for some users very nicely. For a slightly larger screen, the LG Premier Pro is an option. The Quad-Core 1,4 Ghz Qualcomm Snapdragon 425 in the Rebel 4 is a popular processor for budget friendly smartphones as it provides a good balance between power, performance and long battery life. It is not built to run the most demanding games, but it does a good job on everyday activities like social media apps and games. Along with the processor the Rebel 4 has 2 GB RAM and 16 GB internal storage. Most Tracfone devices released over the last year or two have featured this and these days it just really isn't enough, especially the internals storage, to keep up with the needs of most users. We really would like to see Tracfone release a phone along these lines but with closer to 32 GB storage. For those looking for more internal storage, consider getting an unlocked device like the Moto G6 and bring it to the BYOP program. While the camera specs on the Rebel 4 are similar to the Rebel 3, there are some improvements and additional features. The rear 8MP camera has flash, autofocus and burst shot while the front 5MP camera has selfie light, gesture shot and more. Take a look at our recent Guide to Taking Better Photos on your Phone. With a relatively small 2500 mAh battery the Rebel 4 can't keep up with phones like the Moto E5 as far as battery life, but it will generally last through a full day with low to moderate usage thanks to the smaller screen and efficient processor. The battery is removable, which is nice to see. Android 8.1 Oreo brings a number of graphical changes and performance improvements over previous versions. It is used by most Android phones at this time with the newer, Android 9 Pie, currently in the works. Tracfone doesn't update the OS on their smartphones, so it is always a good idea to buy a phone with the latest Android version when possible to avoid possible security issues. The Rebel 4 does not include Triple Minutes for Life because Tracfone stopped including this with newer phones in 2017. Learn more in our post, Tracfone Ends Triple Minutes for Life. The Rebel 4 is a budget friendly smartphone with a smaller screen compared to most phones and good performance and specs to keep up with most daily activities. It doesn't really have and features that 'wow' but rather is a solid smartphone like the previous versions. At $99, it is hard to recommend it over the recently released Moto E5 which shares a number of the same specs (like Processor, RAM, Memory) but has a larger, 5.7" screen, larger battery and is also $99. But for users who don't like such a large screen, this may be a good option. How does the Rebel 4 compare to the Rebel 3 it replaces and is it worth upgrading? Let's take a look. Both phones have a quad-core processor but the Rebel 4 has a newer and slightly faster version. They share the same amount of RAM, internal memory and screen size, but the Rebel 4 has more resolution for better clarity. The Rebel 4 see's several other small improvements including newer Android OS, slightly higher Mega Pixel count on the rear camera, and newer Bluetooth connectivity. We expect to see some deals available in the near future for the Rebel 4 but until then wouldn't really recommend upgrading to it if you already have the Rebel 3 as it would be a modest upgrade. The LG Rebel 4 (CDMA) is available from several online retailers including the Tracfone website. We expect to see a GSM version available on the Tracfone website as well. We also found the Rebel 4 on Amazon. That concludes our review of the Rebel 4. We will update with additional retail locations as we find them. For more information on the Rebel 4, view the User Manual. If you have any thoughts or questions, leave them in the comments below. Don't miss out on our Guide to Making your Airtime Last Longer with special tips included for using less data on your smartphone. We also update the The Best Tracfone Deals, Discounts and Sales each month. And for more on new phones check out our Latest List of Tracfone Smartphones. Finally, join us on Facebook for posts with news, updates, deals and more. 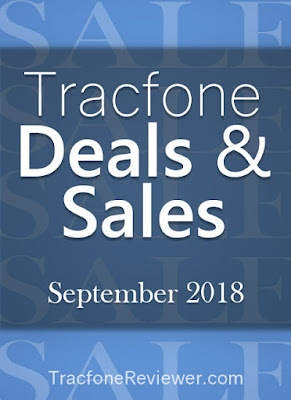 TracfoneReviewer shares all things Tracfone related including news, reviews and promo codes! Tracfone has a number of different phones they offer through many different retailers, and there are sometimes great deals available to be had. However, finding the lowest prices is not always easy. But we are here to help with the latest list of Tracfone deals and sales, updated for September. New deals are happening all the time, and so we share the latest discounts in one convenient list. Many of these deals include an airtime bundle, which are usually the best deals around. Both Tracfone devices and unlocked phones are included in this list, as the unlocked phones can be used with the Tracfone BYOP program. We recently shared details about the Moto G6 and Moto E5 which are two great unlocked phone options. If you like to keep up with the newest releases, visit our List of Latest Tracfone Cell Phones which we update with each new phone Tracfone releases. Now let's see the list of deals! With a 5.7" HD screen, 4000 mAh battery and Android 8.1 Oreo, the Moto E5 looks to be a dependable low cost option for Tracfone users. It also features 16 GB internal space, and 2 GB memory along with a quad-core processor. View more specs in our Moto E5 Review. The Moto E5 was just released by Tracfone and is already available at a very reasonable price from Walmart. With a 5" screen, 2 GB RAM, 16 GB internal storage and Android 7.0, the Rebel 3 is a powerful little device that is also available at a great price. This phone is a great option for users who don't need or want the larger screen size. Learn much more about all the features on the Rebel 3 in our Full Review. Both deals below come with airtime bundles with different amounts, but they are each worth more than the cost of the phone, making the phone practically free! The deal from QVC is the lowest we've ever seen for the Rebel 3 with airtime bundle! If a larger screen is what you want, the Fiesta 2 has a 5.5" screen size plus 2 GB RAM, quad core processor and 16 GB internal storage. It also comes with Android 7.0 and a 13 mp camera. Learn more and see the full specs in our LG Fiesta 2 Review. With this deal from Amazon, you get 1000 talk, 2000 text and 2 GB data plus 60 service days. The Galaxy J3 Luna Pro has proven itself as a popular and dependable smartphone featuring a large, 5" touchscreen, 1.5 GB RAM, 16 GB Storage and quad core processor. It also runs Android 6.0.1 and has an 5 MP rear camera. See more specs and feature in our Samsung Galaxy J3 Luna Pro Review. This deal from HSN includes 1500 talk, text and data minutes plus a year of service which is worth over $100. The airtime bundle from Amazon comes with 1000 talk, 2000 text and data minutes, plus 60 service days. Tracfone makes it easy to use almost an unlocked phone with their prepaid service through the 'Bring Your Own Phone' program. All you need is an unlocked phone and an Activation Kit. We've found the BYOP Activation kit on Amazon for just $1 which is what you will need to get started. You can also get an activation kit from Tracfone or many other retail stores. See our Guide to Activating with Tracfone BYOP if you have any questions on this. Here are some great unlocked phone options to use with Tracfone BYOP. These phones may be a little more expensive than some of Tracfone's devices, but they offer more in terms of performance, storage and features. The newest phone in the Moto G lineup, the G6 has a 5.7" full HD screen, dual rear cameras, Android 8.0 Oreo, Octa core processor and 3 GB RAM/32 GB Storage. This phone offers a great balance between cost, performance and features. It is available unlocked and compatible with GSM and CDMA networks. Featuring a 5.2" screen, octa core processor, 3 GB RAM, 32 GB storage and dual rear cameras, the Moto X 4th gen is available at $120 off the original price. It also has Android 8.0 Oreo, is water resistant and compatible with both CDMA and GSM networks. That concludes our list of deals! Be sure to check back each month for new deals, or join us on Facebook where we share all the latest posts, news and deals. If you have any questions or want to share a deal, leave a comment below! Be sure to also visit our Tracfone Promo Code list for the latest promotional codes to get free airtime when adding minutes. Take a look at our recent post on 8 Tips to take Better Cell Phone Pictures. Welcome to TracfoneReviewer! We share the latest news, review and promo codes! The Moto E5 has a 5.7" screen with 18:9 screen ratio, 4000 mAh battery and runs Android 8.1 Oreo. It is a recently released smartphone from Tracfone and brings a number of great features for the price. 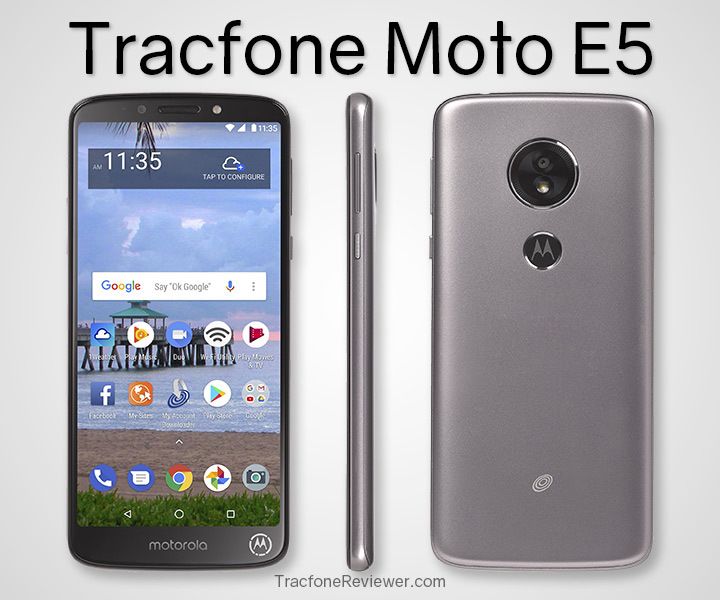 We have been expecting Tracfone to release several Motorola smartphones and the E5 is the first, and hopefully not the last. Several years ago Tracfone launched the original Moto E which come with a tiny 4.3" screen and just 4 GB internal storage. Tracfone has now also launched the Moto G6. The Moto E5 is the second phone available from Tracfone that features Android 8.1, the latest version (Android 9.0 is coming to certain devices) with the LG Stylo 4 also featuring Android Oreo. 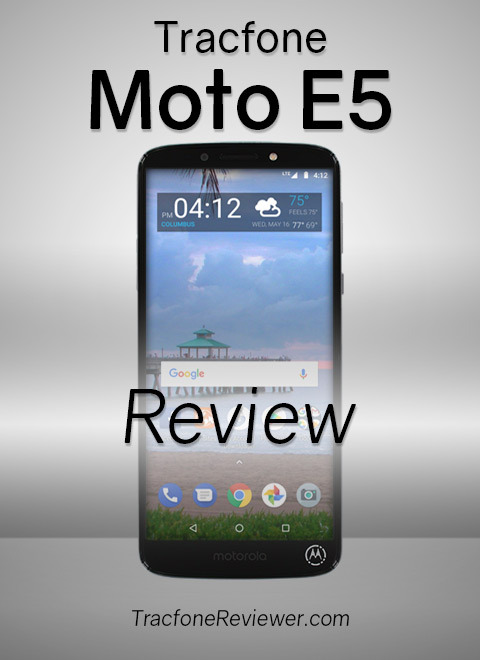 The Moto E line of phones from Motorola is well known for the good value at a very reasonable price and we will see how the Moto E5 stacks up to this in our review. There are several unlocked variations of the Moto E5 available including the E5 Plus and E5 Play with various differences for each version. These unlocked smartphones are compatible with GSM networks unlike the Tracfone Moto E5 which is only compatible with CDMA. The unlocked Moto E5 is not available in the US market and actually has some differences to the Tracfone Moto E5, including a higher resolution rear camera at 13 MP compared to the Tracfone versions 8 MP. Time for the full list of features on the Tracfone Moto E5. Motorola was an American telecommunications company founded way back in 1928. But in 2011, after several years of significant losses, the company was split and the mobile phone segment of the company was sold to Google. After just two years, the Motorola mobile phone segment was again sold, this time to Lenovo in 2014. Despite changing hands several times, Motorola has maintained a consistent stream of budget friendly smartphones in several lineups including the Moto E and Moto G lines, that are well known for good value. The Moto G line, with the Moto G7 the current model, offers a little more power and performance for a somewhat higher price compared to the Moto E line. The touchscreen on the Moto E5 is actually very nice for a phone at this price point. It has a 5.7" screen with 720x1440 HD resolution. Motorola adopted the 18:9 resolution which has become popular on higher-end smartphones and allows for a taller, thinner design. The screen is an LCD panel, which doesn't pop quite as well as an OLED screen found on more expensive devices, but for the price of the Moto E5, it works very nicely and looks good. The Qualcomm Snapdragon 425 is a popular option in budget smartphones and has enough performance for most tasks with its Quad-core 1.4 Ghz processor. One of the nice features of newer processors like this one is that they can reduce power usage and run quieter when doing low performance tasks. This is one of the factors that helps the Moto E5 have a very impressive battery life. The 2 GB RAM and 16 GB internal storage are not very exciting as many users are finding they need more storage for apps, photos and videos and more. It would be nice to see at least 32 GB internal storage. The Moto E5 does have a micro SD card slot for up to 128 GB extra storage. The 8 MP rear camera on the E5 is adequate for snapping images to share with friends or recording videos to post on social media but it isn't anything too impressive. Along the same lines, the front 5 MP shooter gets the job done for snapping selfies and such. While the Tracfone Moto E5 version has the 8 MP rear camera, the unlocked version has a 13 MP camera which does capture higher quality images and higher resolution. This must have been one of the areas Tracfone decided to cut corners to keep the price low. One of the strengths of the E5, and many Motorola devices, is the long battery life. This phone comes with a non-removable 4000 mAh battery which is rated to last 32 hrs talk time, 10 days on standby. Actual battery life isn't quite the same, but it definitely will go a full day on a single charge with low to moderate usage which is very nice. Android 8.1.0 Oreo is the operating system on the Moto E5 and it brings a number of appearance and performance improvements over previous versions. Tracfone does not provide their smartphones with OS updates so whichever version it comes with is what it will keep. With Android, users have access to the Google Play store with over 1 Million apps covering almost anything you could think of. We have created a helpful Guide to the Best Android Apps to use with Tracfone so take a look if you need some ideas. The overall design and feel of the Moto E5 is quite good despite the plastic materials. All the buttons are in convenient places and even the fingerprint sensor on the back works well. The standard 3.5 mm headphone jack is at the top, with the USB charging port at the bottom. Some features on the Moto E5 are not too exciting but for the most part, the phone is a strong contender for an everyday smartphone that can handle most tasks thrown its way. It is certainly a budget phone, but a good value for what you get. We see this being a popular replacement for older Tracfone devices like the LG Rebel 2, Samsung Galaxy Luna, and other older smartphones. This isn't the best phone for everyone, however, as the low internal memory will limit the number of apps and other media users are able to store on it. For users looking for more storage, we recommend the Tracfone BYOP program, where you can bring almost any unlocked smartphone to use with Tracfone including the Moto G6 which comes with 32 GB storage. The Moto E5 and G6 were released about the same time by Motorola with the G6 the 'step up' model. While these two phones share the same screen size, they don't share much beyond that with the G6 offering more RAM, internal storage, better camera, better processor and higher resolution screen. The E5 does have a larger battery. The Moto G6 is also more expensive, with the unlocked version now at under $200. Tracfone now also offers the Moto G6 and it is mostly the same as the unlocked version except it comes with 3 GB RAM, 32 GB Storage and uses only CDMA networks. The Tracfone Moto E5 is also on the Tracfone Website for $119. We expect to see it offered in the near future from other sources and will update as soon as possible. For additional information, view the Interactive Tutorial. That concludes our review of the Tracfone Moto E5. If you have any thoughts or questions, leave them in the comments below. Take a look at some of our recent posts, including a Guide for Making your Airtime Last Longer and Everything you Need to Know about Data Cards. For the latest news, follow us on Facebook! And don't miss out on the best Tracfone Deals, Discounts and Sales! TracfoneReviewer shares the latest news, review, and Tracfone promo codes! 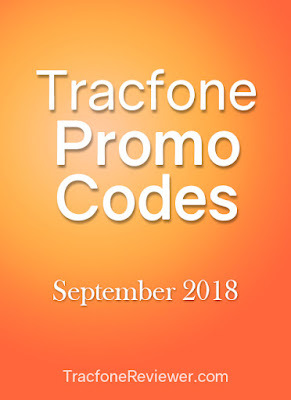 Fall is in the air and so are new promo codes for Tracfone! Each month we gather and share with our readers the latest promotional codes to use with Tracfone. Tracfone offers these codes as a bonus for loyal customers who can get anywhere from 30 to 300 extra minutes for free. To use the code simply enter the code with the proper airtime card when purchasing or adding minutes to your phone. There are both regular airtime codes and smartphone only codes. Sometimes a code may be one time use, while others can be used multiple times. The regular airtime codes are for a specific card, but can also be used with cards of greater value in most cases. Want to reduce how much airtime you use? Check out 7 Tips to Make Your Airtime Last Longer including helpful details about data usage. Tracfone recently released the new LG Stylo 4 with a large, 6.2" screen and more. Follow the link for the review or visit our List of the Latest Tracfone Devices (2018) for all the new phones. Now let's see the promo code list. Some codes are one time use. Most codes can be used with cards of greater value as well. No new smartphone only codes at this time. See our main Tracfone Promo Code page for older smartphone codes which some users have had success using. We will update as soon as we can. Those are the latest codes for September 2018 gathered by TracfoneReviewer. We hope these codes work for you and let us know in the comments if you have any questions or thoughts. Keep up with the latest Deals, Discounts and Sales from Tracfone for the lowest prices from around the web. Join us on Facebook with a growing community of helpful Tracfone users who can answer any questions or send us a message directly. Don't miss our Guide to Better Cell Phone Photography which will help anyone take better pictures on their smartphone. And lastly, if you're shopping for an unlocked smartphone to use with Tracfone don't miss out our List of the Best Tracfone BYOP Devices including several of the best budget smartphones available. Enjoy this blog? It would make my day if you got me a coffee! Copyright © 2018 TracfoneReviewer All Rights Reserved. Powered by Blogger.